When ASUS launched the GX501 Zephyrus last year at COMPUTEX 2017, it was a one of a kind device borne out of the collaboration between NVIDIA and ASUS. It was the first MAX-Q laptop to be announced and it was a pretty decent device for that reason. There were a few drawbacks with the build quality since it used a hatch mechanism on the underside which was a bit flimsy. Moreover, using it as a ‘lap’top wasn’t optimal given the hatch design. However, such misgivings are expected with one of a kind devices. 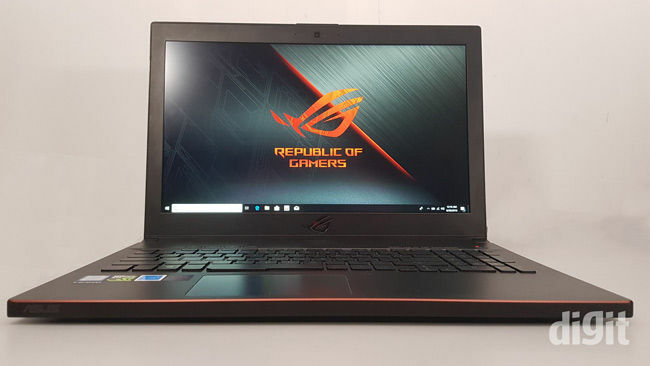 Hopefully, ASUS has worked on all of those issues before coming out with the ASUS Zephyrus M GM501 gaming laptop that we have with us now. The ASUS GM501 Zephyrus M brings with it quite a few improvements over the GX501. The ones that stand out are the 144 Hz display panel, a better GPU i.e. the GTX 1070, a sturdier hatch and the top-of-the-line Intel Core i7-8750H CPU. It still retains the slim form-factor of the Zephyrus GX501 even with a similar TDP NVIDIA GTX 1080 under the hood, which would make one question the whole MAX-Q SKU stack but there’s more to that story that we’ll see later on. So what changes did ASUS bring about on the inside to make this happen? Let’s take a peek inside and find out for ourselves. Before we get into that, let’s have a look at the specs. The ASUS GM501 Zephyrus M is powered by the Intel Core i7-8750H and an NVIDIA GTX 1070. So we definitely have a way better CPU than the original Zephyrus GX501 but the GPU has been taken down a notch. The GTX 1070 isn’t that far off from the MAX-Q GTX 1080 but it’s still a noticeable downgrade. The Indian SKU has just one 16 GB DDR4 DIMM which is a bit of a disappointment given that the GM501 is a premium laptop. Reducing the memory to single-channel is not advised given the performance drop experienced. Moreover, the cost difference between having a single 16 GB DIMM vs 2x 8GB DIMMs isn’t that much. So it’s a simple spend to offer more value to the customer that ASUS has missed out here. Like the Zephyrus we saw last year, the Zephyrus M comes across as an extremely thin concept device featuring the same hatch design. The hatch in question, has been made more durable and the opening, a little wider. However, before we get to the hatch, let’s take a look at the other parts of the body. The rear side of the panel retains the brushed metal finish with a distinct line that parts the surface diagonally. 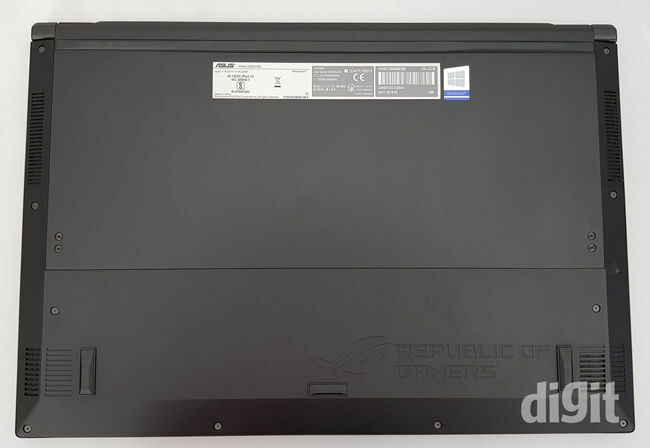 The ROG logo has a backlight and is not an over-the-top implementation. 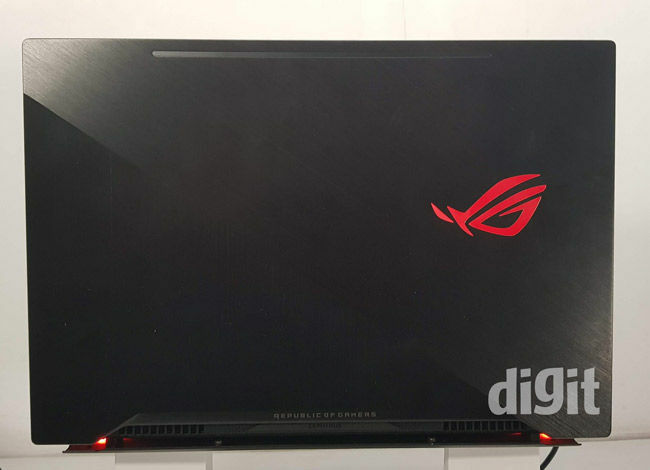 We’ve seen the newer design in the FX504 and the GL504, so a dash of RGB to the ROG logo isn’t bad looking. The underside sports a fairly clean look. There are three rubber pads on the bottom surface. The longest one gives away the hatch opening and can be seen running across the edge of the hatch opening. Essentially, the laptop rests on this one edge. While the reduced dimensions of the hatch does make the design a bit more durable, we’re still a bit iffy about the entire laptop resting on the edge. It’s only when you open the lid, that you see vents magically appear out of nowhere. On the GX501, the hatch in its open state would raise the Z-height by 1 centimeter from 16.9 cms to 17.9 cms. With the GM501, the change is from 17 cms to 19.9 cms. At 2.9 centimeters, that’s twice the z-height as compared to the older Zephyrus. However, because the GM501 is thicker than the GX501, the relative distance doesn’t make the hatch opening seem wider. So how’s this more durable? On the GX501, the lid that opened up was massive and practically took up half the surface area on the underside. So you had a huge hatch that was supported at 3 points. The GM501 has a similar design, except the bottom edge is reinforced with an extra set of screws and the since the GM501 is smaller than the GX501, there’s the added durability. Just like the GX501, the GM501 also has the nasty habit of catching your trousers if you’ve put it on your lap. You have to be a bit more careful while lifting the device, should anything snag the hatch and should you yank the laptop to set it free, you’re going to have a bad time. We took the hatch off and saw a similar set up as with the GX501. Only this time, the fan assemblies aren’t painted black. Given that nobody’s ever going to see this side of your laptop, that’s a wide place to save on some money. The underside is the primary intake for the fans. 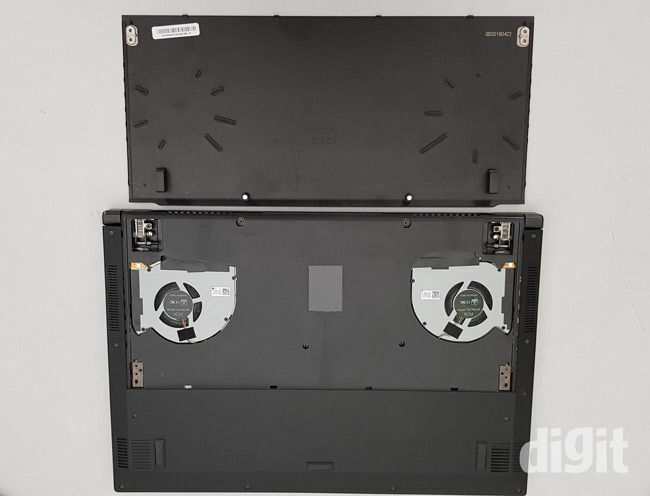 We see the similar hinge as the GX501. The entire hatch mechanism relies on the hinge and it’ll be interesting to see how the hinges are able to weather being exposed to the elements in such a design. On the inside, the design is fairly standard. This is a thicker notebook, so ASUS didn’t have to go through all the pain of slimming down components and spreading them across the entire area. The battery takes up a smaller footprint but due to the added thickness, is of a higher capacity. It’s gone up from 50 Whr to 55 Whr. The GM501 Zephyrus M comes with a single 16 GB DIMM making it operate in single channel. 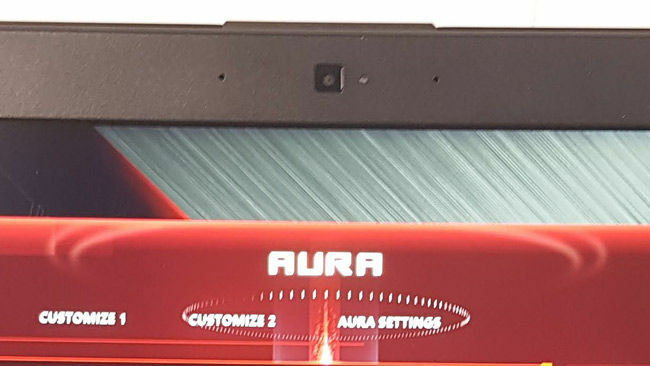 Looking at the edges, we can see that ASUS did not have the real estate to add in more connectivity options. This explains the lack of an SD card reader. The location of the speakers aren’t symmetric but you don’t feel the difference during day to day usage, so that’s fine with us. A closer look at the cooling assembly reveals a set of dedicated heatpipes as well as shared heatpipes for the CPU and the GPU. Additionally, there’s one running across the VRM circuitry as well. The intake opening on the fans seem to be the same as most laptops, so all that we’re getting with the hatch design is a more unencumbered airflow. Also, the fans draw air in from the upper surface as well though that’s not going to be as open as the underside. The vents on the GM501 have a slightly larger opening on the end of the fin assembly. This is for the heavier particles to easily make it way out. Here’s a close-up of one of the speakers. You can see the rubber rings used to reduce vibration. Also note the presence of I/O ports all the way till the edge. Like we said earlier, there doesn’t appear to be any more real estate available for more I/O ports. Overall, the GM501 has a very standard design for the motherboard. The hatch has been made more durable though we need a bit more convincing as to why the hatch design was retained since the laptop is much thicker this time around and there was definitely more airflow because of that. 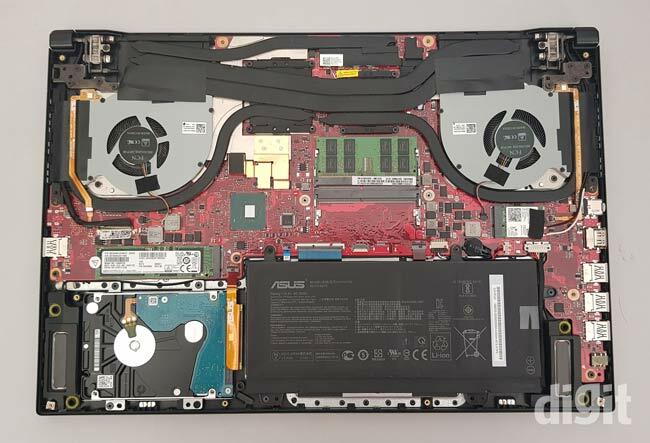 Given how the competing unit from MSI, the GS65 Stealth Thin 8RF makes do without a hatch, we wonder why ASUS chose to go with a hatch in the GM501. 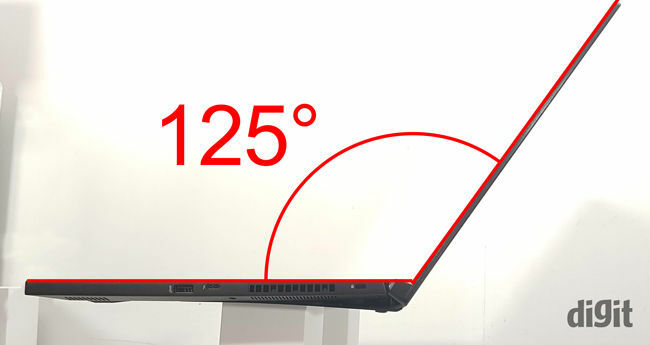 At 17.9 cms, the GS65 ends up being thinner than the GM501 during operation. Was the hatch really necessary this time? One of the biggest differences with the GM501 is the more traditional keyboard layout. The GX501 had moved the entire keyboard assembly right up to the bottom edge. This was to allow for the cooling assembly to make the best of the hatch design and to avoid raising the touch temperature. On the Zephyrus M, that isn’t as big a concern since the GTX 1070 runs slightly cooler than the GTX 1080. The touchpad has become separate and is no longer a convertible numpad. There’s a bit of cost saving here which works out better for the customer. We also see dedicated buttons on the top left for the audio as well as for the ROG Game Centre. The GX501 was not comfortable to use on the lap but the GM501 feels much better. The hatch edges can sometimes catch your trouser fabric and pull, though we don’t feel that would be that big of an inconvenience for most folks. Did we mention RGB? Well, there’s Aura Sync RGB with 4-zones across the keyboard. 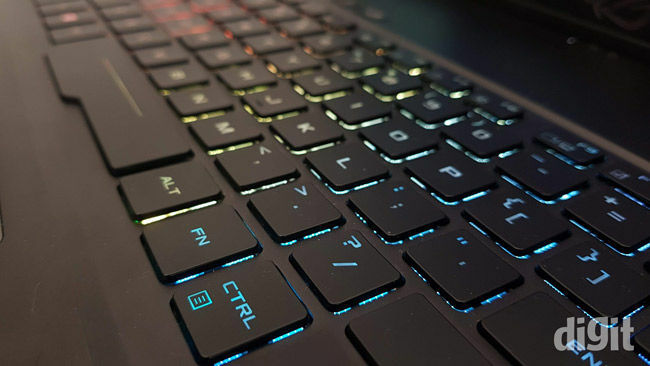 The WASD keys have translucent edges so they stand out from among the other keys. The texture for the WASD keys is the same as the others. There’s no dearth of USB ports on the GM501 Zephyrus M. Just like the GX501, all ports seen here are USB 3.1. The ports are all coloured black so everything matches the theme and there are no garrish blue plastic tabs visible anywhere. There’s a Type-C USB 3.1 port on the right side and it even supports Thunderbolt. There’s no ethernet port or an SD card reader. You’ll have to use a USB-to-Ethernet adapter to get a wired network connection. As with the GX501, there’s no way an SD card reader could have been added without increasing the thickness of the laptop. Since slimness is a key factor for the Zephyrus series, we can understand why ASUS didn’t add the SD card reader. As for the cooling vents on the right hand side, we’ve mentioned in the past that we’ve never been fans of this setup. 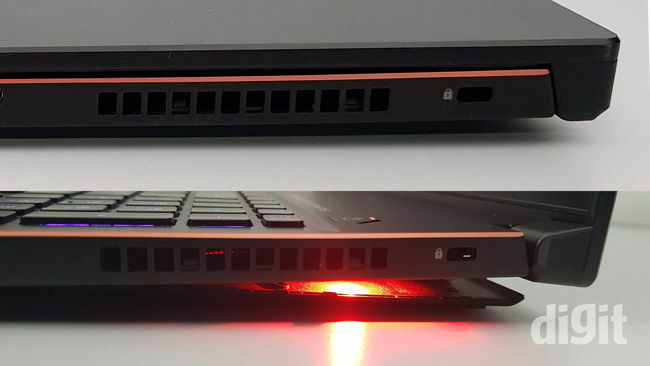 With a slim laptop such as the Zephyrus M, there isn’t much of a choice other than pointing the vents slightly upwards. However, the GX501 had a 60Hz panel and this here is on the GM501 is a 144Hz panel with support for NVIDIA G-Sync. It’s brighter, has support for a wider colour gamut and the response time is 9ms (Tr+Td). So overall, the display is way better than the one on the GX501. The webcam is HD ready but that’s about it. There’s hardly anything to look forward to here. It’s good enough for video conferencing and other simple uses but should you wish to plug your face in a game stream, then we’d suggest going with a more refined aftermarket webcam such as the C920 or the C930 from Logitech. With the newer and more refined hatch design, the Zephyrus M has a slightly wider opening. The older Zephyrus could do 120 degrees, while this one can do a teensy bit more at 125 degrees when measured from the top surface. When we use the bottom surface with the hatch open as the point of reference, then there seems to be hardly any change from the older Zephyrus. The small increment is a welcome change but we feel that ASUS could have done better in this regards. This would mean shaving off a millimeter or two off the top-end of the hatch to allow the display panel to open up further. Most gaming laptops that we’ve seen in this price segment couple the hexa-core Intel Core i7-8750H with a GTX 1070. However, the single-channel memory might cause some of the numbers to be lower than competing products. 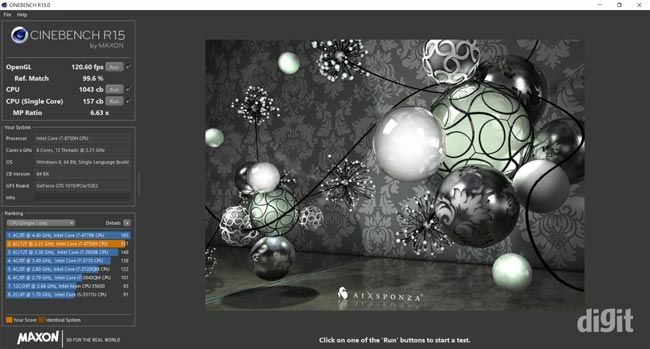 In Cinebench R15 we saw 1T score of 167 points and and nT score of 1043 points. 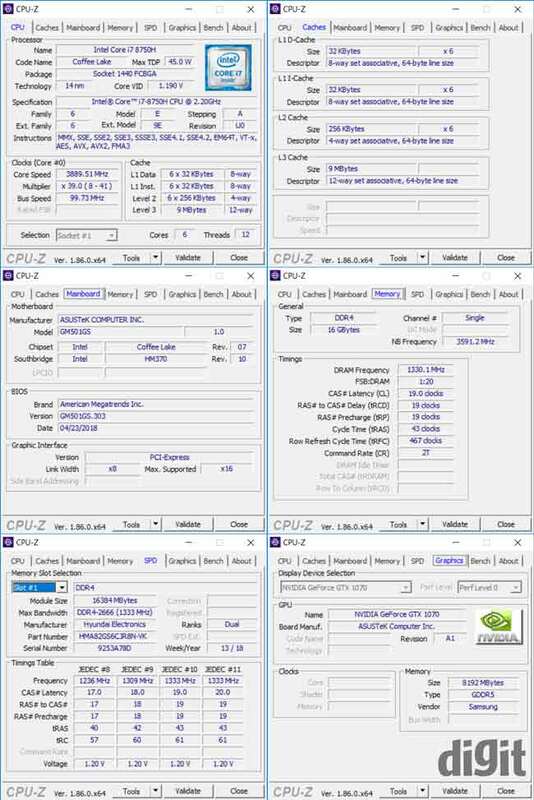 These are very typical performance figures for the Core i7-8750H. Scores from PCMark10 Extended run are as follows, Web Score - 8389, Apps Score - 9119, Chat Score - 7830, Photo Score - 2925, Video Score - 3113, Writing Score - 6035, Spreadsheet Score - 4700, Essentials - 8429, Productivity - 5325, Digital Content Creation - 4245 and for Gaming - 11683. To showcase the performance difference brought on by the single channel setup, we ran a memory benchmark to get read speeds of 19346 MB/s and write speeds of 19838 MBps. If ASUS had used 2 DIMMs instead of one, these numbers would have been in the vicinity of 37-41,000 MBps. While real world performance doesn’t scale in the same manner, you can expect about 11-17% performance difference. The Zephyrus M uses a combination of the Samsung SM961 and the Seagate FireCuda 1 TB drive for storage. The former being a fast NVMe drive and the latter, a hybrid drive. We can see how they fare with different transfer sizes below. It should be noted that the Seagate FireCuda drive will not reflect its true characteristics in synthetic benchmarks because the caching feature simply cannot be accurately depicted in this manner. This is why you see the high read speeds while all other characteristics are the same as normal drives. As for the Samsung SM961, you can see how that’s totally worth the money. It’s got great transfer characteristics for chunky data as well as for more smaller file sizes. We did notice that the transfer rates were slightly lower than other SM961 modules we’ve tested. They usually average in the higher 1800s for the Q32 read speeds. For Wi-Fi and Bluetooth, the ASUS Zephyrus M uses an Intel AC-9560NGW CRF module. It’s in the same league as the Qualcomm Atheros QCNFA344A. They’re both Wave 2 CRF modules but the 9560 is the newer module with support for 160 MHz channels and Bluetooth 5.0 whereas the Qualcomm chip only has Bluetooth 4.2 and we see no mention of 160 MHz channels despite the fact that it is a Wave 2 module. In our benchmarks, the upstream numbers featured in the higher 600s (Mbps) and the lower 600s for the downstream numbers. It doesn’t feature a separate QoS solution to prioritise traffic, but you can always install one yourself and get the job done. The Zephyrus M sports one of the more high-end configurations aimed at gamers. The hexa-core Core i7-8750H and the NVIDIA GTX 1070 make for a very powerful configuration. Sure, it’s not exactly the same as a desktop GPU but combined with a 144Hz FHD panel, the Zephyrus M ends up being an FPS churning machine. In Fire Strike Ultra, we managed to get 3970 points. As for Extreme and the basic run, the scores were 7536 and 14038. In TimeSpy, we scored 5291. The 1070 on the GM501 is clocked at 1443 MHz with a boost clock of 1645 MHz, so it’s fairly close to the desktop GPU in terms of clock speeds but the mobile Pascal GPUs have a few extra shaders. That coupled with the slightly lower shared count makes it quite the performer. Moving on to the games, we managed to get about 90 FPS in Far Cry 5, 112 in Witcher 3, 90 in Rise of the Tomb Raider and about 90-95 in PUBG. Some of the older games would scale well into the high 130s. Given the 144Hz panel on the Zephyrus M, it’s a visual treat to enjoy fluid gameplay at high frame rates. There are two variants of the Zephyrus GM501, the GTX 1060 based GM501GM and the GTX 1070 based GM501GS. The former is priced at Rs.1,59,990 and the GTX 1070 variant is priced at Rs.1,99,990. We’re seeing a lot of competition in the gaming laptop space and this would be the first time that ASUS has priced a gaming laptop with a significantly better CPU at practically the same price as the previous gen iteration. If you were to build a PC with the same specifications, then you’d end up with a budget of about Rs.1,45,000. You can stretch this to Rs.1,60,000 by shopping from online retailers. So the overall difference stands at Rs.40,000 for shrinking all of that into a compact and portable form factor. However, ASUS isn’t the only one to do this. 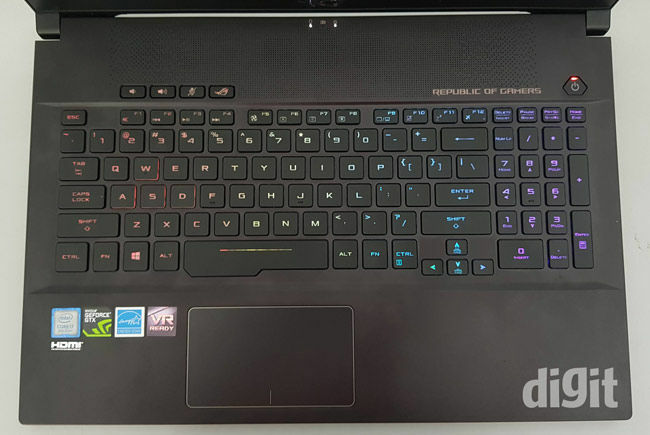 The closest competitor to the GM501GS that we’re reviewing would be the MSI GS65 8RF which has practically the same set of specifications except for a few differences in the networking equipment and the audio spatialisation software. It also has dual channel memory and is equally thin as well. The MSI unit currently sells for 1,89,990 making it more appealing to the Indian buyer by being a good 10K cheaper.